Whenever someone visits your Pathbrite ePortfolio, Pathbrite collects some data on your visitors and summarizes that data as Insights. 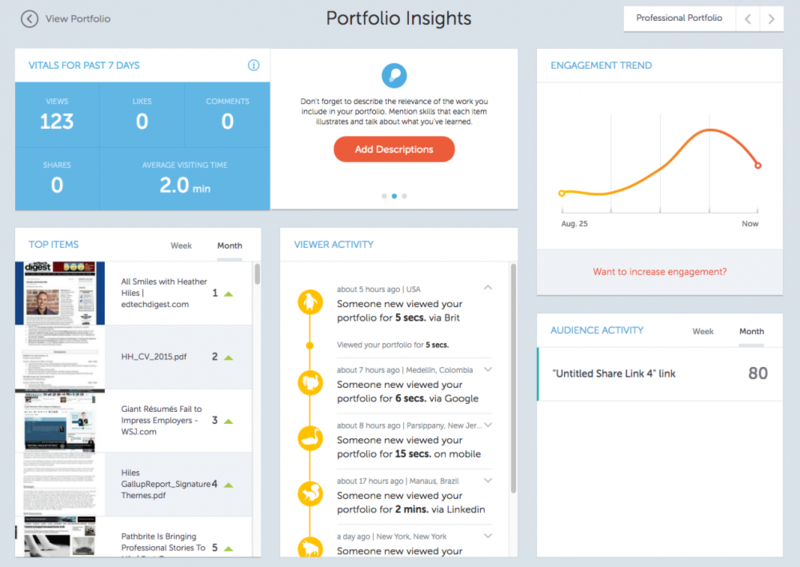 With a portfolio selected, click the View Insights button on the right of your screen to view your “Portfolio Insights” page. You can also get here from your Profile page, by clicking on the View Insights button at the bottom right of each of your public portfolio tiles. The arrow buttons in the upper right corner will allow you to quickly switch from portfolio to portfolio. The vitals report how many times your portfolio has been viewed within the past seven days. This panel will also report the number of “likes” and comments you’ve received, as well as how many times (other) people share your portfolio. The tips panel suggests what you may want to try adding or improving, in order to increase your portfolio visibility. The engagement trend is a one month graph indicating whether your vitals are increasing or decreasing over time. If you have created an access code for your portfolio, your audience activity is a breakdown of visits per access code. Please see sharing your portfolio for more on access codes. Your viewer activity shows who recently viewed your portfolio and where they are. If that person logged into Pathbrite, we will display a name. Otherwise we’ll refer to that person as “someone”. Each person will get a separate animal icon. *Do not panic if you see a visit from a geographical location or a site that you do not recognize. Your friends may be traveling or the database we use to identify their locations may be out of date. The Top Items panel will indicate which artifacts in your Pathbrite ePortfolio that your audience liked the most and/or lingered on the most. Anyone who visits your portfolio (other than you) is considered a visitor. When they visit your portfolio, it is cached for the duration of the visit, so if they view your portfolio twice, log out, then log back and visit your portfolio again, it counts as two visits, not three.